In looking over the album of old pictures with Mr. George W. Schultz and his sister, Mrs. Louis D. Peterson, so carefully preserved by the former that they are still clear for reproduction in this column more than 60 years later, it has been interesting to try to discover why their parents should have left the city of Philadelphia in 1888 to establish a new home in what must have seemed at that time a quiet rural section of Pennsylvania. To discover their reasons is perhaps to understand better why George W. Childs should have found it so easy to obtain purchasers for his “Wayne Estate” houses once they were built. The sudden transition from a quiet community of a few farms centering around the Wayne Presbyterian Chapel, the old Opera House and Louella Mansion of Wayne of 1870, to the rapidly growing suburb of 1890 seems, in retrospect, to have been an almost startling one. George H. Schultz, the father of George W. Schultz and of Mrs. Peterson, was a native Philadelphian, the son of William Schultz, one of the pioneer railroad men in the United States. Always interested in machinery, the latter early became associated with the old firm of Isaac and Levi Morris, rivals at that time of the Baldwin Locomotive Works. He was sent to Berlin with two locomotives, ordered by the Emperor, who had a little railroad which ran the 16 miles between Berlin and Potsdam. After Mr. Schultz had been in St. Petersburg for a year he sent for his family to join him, and after weeks on a sailing vessel they reached St. Petersburg, their home for the next twelve years. During that period the development of railroading in Russia gained steady momentum. At one time the government offered Mr. Schultz general charge of the entire railroad system of the empire. This, however, he declined, and in 1852 returned to America. This home of the Schultz family is the one now numbered 211 Walnut avenue. 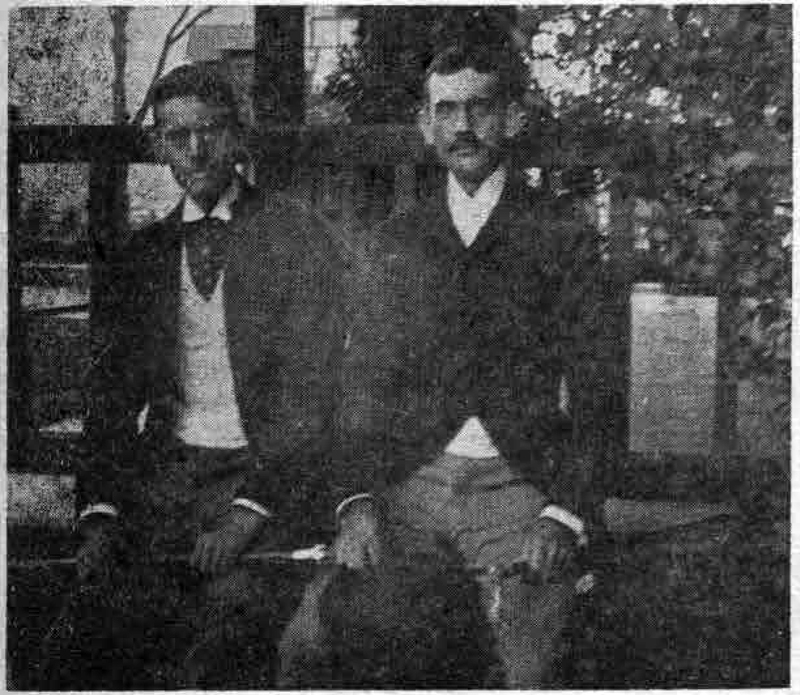 The one to the right of it was occupied by Mr. and Mrs. Henry Baring Powel. Later Mr. and Mrs. Robert Hare Powel also came to South Wayne to live. The Powel brothers were young men of about the same age as George Schultz and his brothers, and close friends of theirs. They had formerly lived in Philadelphia, just as the Schultz family had, moving to Wayne for much the same reasons as the latter had done. The Powel house on South 3rd street, Philadelphia, which dated back to 1768, was of such beauty and such historical interest that the furnishings of its drawing room have been moved into a similar room in the Philadelphia Museum of Art, where it is the center of great interest to visitors. Thus we glimpse why at least three Philadelphia families, first the Thompsons, then the Schultzes and soon thereafter the Powels, moved from well established Philadelphia homes to what had been the quiet little rural settlement of Cleavers Landing, later named Wayne, to be among the first owners of George W. Childs’ Wayne Estate houses. Again this week we are presenting pictures from an old album belonging to George W. Schultz. All of these pictures were taken in the late 80’s or early 90’s by Mr. Schultz himself. This picture of old St. David’s Church, looking much as it does today, was taken in 1891. It recalls to Mr. Schultz’s sister, Mrs. Louis D. Peterson, the various picnics that the young people of that period held there. Several were given in connection with church fairs, she tells us, and when I asked her if they were like the [ ] fairs that old St. David’s has these days, her answer is that most of the wares that went on sale were along the food line. With no automobiles to whisk the picknickers to their destination, it was much more of a trip to the church than it is now. 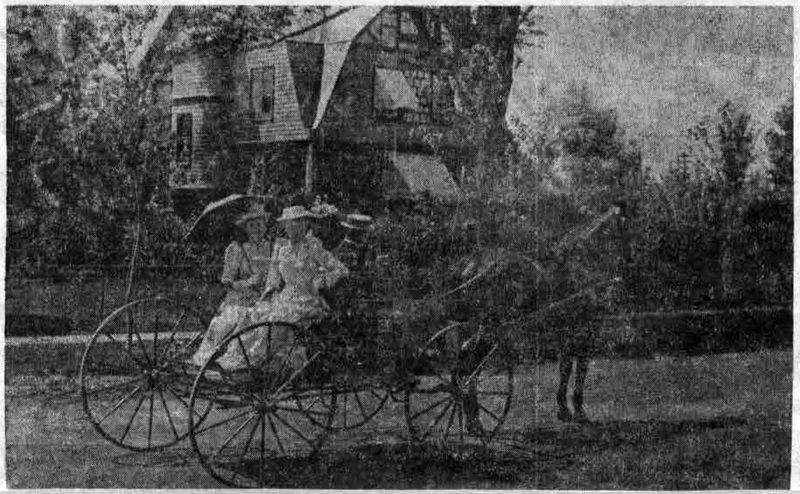 The picnickers arrived by buggy or buckboard, some by the 1890 version of the “station wagon”, others by bicycle. Once there, they roamed around among the old tombstones, and even went into the dark, spooky mausoleums. Some of the equipages that took the young people on their picnics were of the type shown in the above picture, the so-called “dog-cart”, that was so popular at the turn of the century. This was distinguished from some of the other vehicles of the period in that it was very light and had two transverse seats, back-to-back. An interesting part of this picture is the lantern attached to the side of the car for night driving. The four young people who appear to be out for a leisurely afternoon’s drive have been identified by Mrs. Peterson as Charles Harbert in the driver’s seat with his sister, Miss Helen Harbert, beside him. 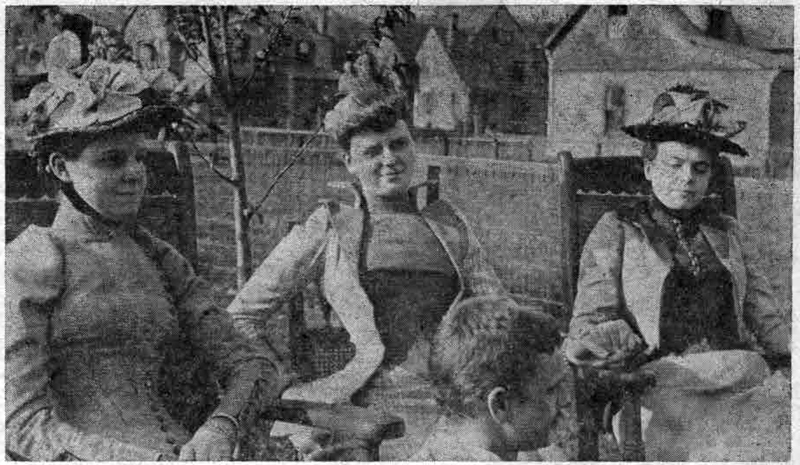 Another sister, Miss Maud Harbert, is on the back seat beside Mrs. Peterson (then Miss Gertrude Schultz), who is carefully protecting herself from the sun’s rays with a parasol. 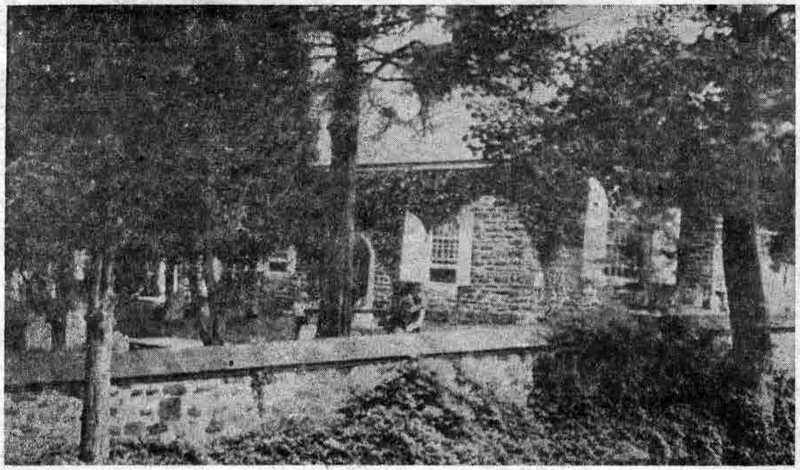 George H. Schultz, who was taking the picture, evidently stood in front of his family home, now numbered 211 Walnut avenue, as the house shown so clearly in the background of the picture is the one directly opposite it, at present occupied by the new superintendent of schools., H.K. Idleman and his family. Next door to it on the right was the old Harbert homestead, now occupied by the McGinley family. This picture, taken in 1890, shows still another means of “getting places” by one of the forerunners of the modern bicycle. This was one of the types of “safety” bicycles which followed the “Ordinary”, as the bicycles with the high front wheel were called. Bicycles like the one in this picture were those owned by members of the once popular “Bicycle Club” of Wayne, which was described at some length in this column several years ago, from data furnished your columnist by Mr. Schultz. 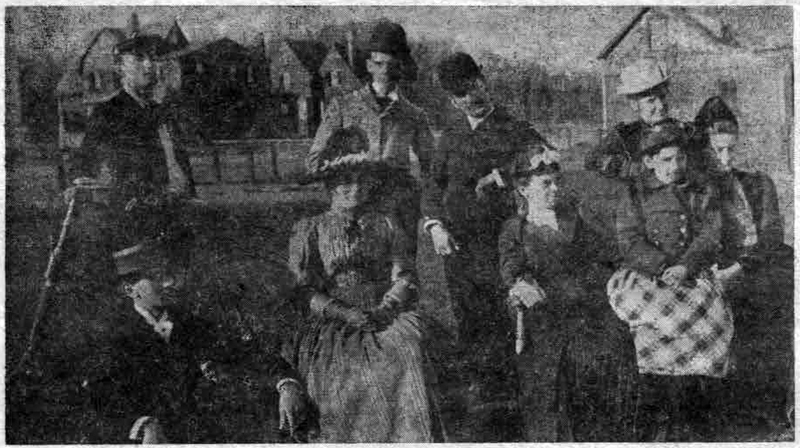 Those in the picture are: Back row (left to right), Olney Croasdale, William Schultz, William Pinkerton and Mrs. Frank Farrell. Front row (left to right), George Schultz, Emily Sayen, Gertrude Schultz, a young visitor (name now forgotten) and Mary Farrell. The pictures used to illustrate this week’s article have been chosen by your columnist not only because the young men and women in them were among the newcomers to Wayne in the late 80’s, but also because they illustrate the kind of clothes worn at that period. The three charming young ladies who are seated in one of the large side yards in North Wayne are (left to right) Miss Helen Harbert and Miss Gertrude Schultz, who married the late Louis D. Peterson, and now resides on East Lancaster avenue, St. Davids. The Misses Harbert, when they first came to Wayne, lived at 200 Walnut avenue with their parents, in a house almost opposite the Schultz home, and identical to it architecturally. This house is now occupied by the McGinley family. Miss Helen Harbert, who is deceased, married George Brooke. Her sister, Miss Maude Harbert, who remained unmarried, is still living, although not in Wayne. Although “Sunday garb was not much different from that of week day”, according to Mr. Schultz, we rather think that this picture was taken on a Sunday. With their gold headed canes across their knees and their derby hats in their hands, these brothers might have been about to walk to St. Mary’s Episcopal Church, of which they were members, or if the picture was taken in the afternoon, they might have been ready to start out on the round of “calling on friends,” the regular Sunday afternoon routine in Wayne of 60 years ago. “Those afternoons were quiet, restful ones”, Mr. Schultz says reminiscently – and like the more formal elegant clothes of that time now past, those days must indeed have had a charm all their own. As George W. Schultz and your columnist sit in his pleasant living room in the Anthony Wayne Apartments and turn the pages of his old photograph album, the Wayne of 1890 seems to come alive through these splendid pictures, as clear and distinct as they were when he took them more than 60 years ago. Here are the Wayne Estate houses, as they appeared when they were just completed, looking very trim and neat, but against a background strange to eyes of the present day. For most of our wide-spreading trees were slender saplings then, and our tall, thick hedges had not even been planted. Other things are strange, too… the quiet streets free from automobile traffic with only the occasional horse and cart as the pleasure vehicle. 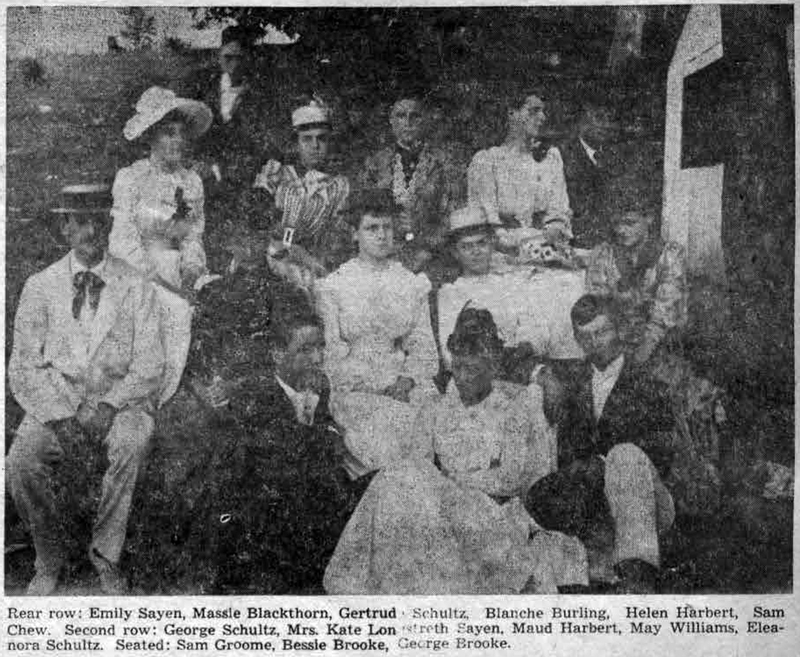 Some show families sitting on their front porches, others are of young people on a tennis court or in groups on the lawn, and two are of a picnic at Valley Forge in August, 1890. 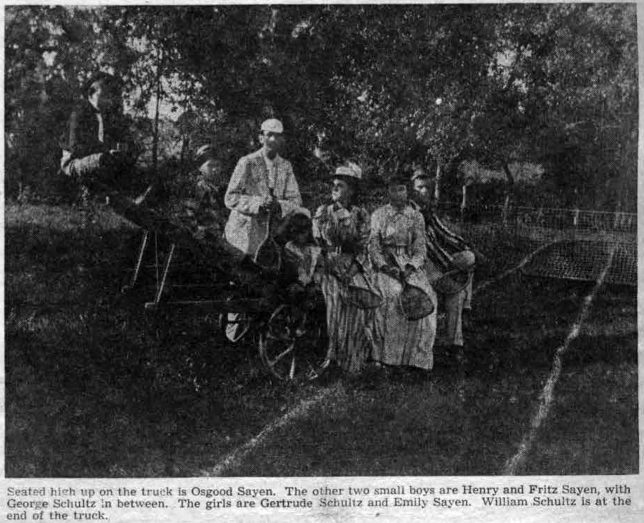 As your columnist examines more closely the picture which she has chosen for illustration for this week’s column, she asks, “What did the young people do for entertainment and amusement in Wayne in 1890?” And Mr. Schultz answers from the experience of his own youth. “When young persons went to a friend’s house at night, they had to walk, carrying a lantern when there was no moonlight… the general evening’s relaxation was to play cards, euchre, poker and the new game, bridge, just introduced. In summer, outside of the baseball club, many families had tennis courts. There were dancing parties at the Saturday Club house about once a month, and amateur theatricals occasionally in the Wayne Opera House. And then there were summer “hops” at the Bryn Mawr and Devon Hotels. The following is one of the pictures taken on that August day of 1890. The background is a far cry from the beautifully kept park-like Valley Forge of today. And as we look at people of 60 years ago, so formally dressed for this picture, we cannot but wonder what they would have thought of the picnic attire of their grandchildren and great-grandchildren of today – the wind blown hair of our hatless girls and boys – their slacks and their shorts – their bare legs – their feet encased in flopping moccasins! Complete identification of all those at the picnic has been made by Mr. Schultz. So much for the hayride to Valley Forge Park in the big horse drawn wagons and for the picnic on Mt. Joy. 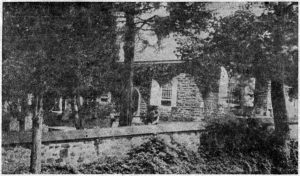 The second picture shows the tennis court on the old Sayen place, which is still located just across the street from the site of the First Baptist Church, on Conestoga road and West Wayne avenue. This church was torn down in the spring of 1952. The Sayen house is now the home of the Italian-American Club. This picture was also taken in August 1890.